It’s been a long time since I blogged. I do owe and apology to you and two other people in EPM space. Three of us were working on developing some EPMA SQL queries (or just say, trying to make sense of the EPMA backend tables). Cameron was kind enough to share the queries he and Dan developed and I was supposed to start/continue with my EPMA series. I failed to do so, I can say that I had a tight schedule (it is a real fact) and all sort of valid excuses, however I’m not going to say those. I’m not sure whether we’ll be seeing EPMA in a near future (Data synchronization is going away soon, who know what is next). For those EPMA die-hard fans here we go. DS_PROPERTY_APPLICATION_ARRAY stores the property information of an application. 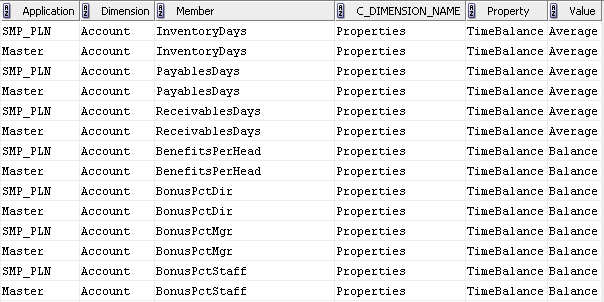 Application Class is a Dimension in EPMA and has a value 4. Different Application classes has their own values. Let’s look at the ID’s of different Applications. More fun, here is a query which will give you all the “SmartList” members. --ORDER BY "Application", "Dimension", "Member", "Property"
Re: "Data synchronization is going away soon…" – has there been an announcement from Oracle. Wasn't aware of this.